I had attempted to blog a few years ago, but it just didn't take...I did maybe two posts, a year apart. That's not so great. So what prompted me to get back into blogging? The answer is easy...TCC13. This was my third Tableau Customer Conference and I know how these things kinda work now. As I read over my first post, A Look Back at TCC13, it describes how I feel about the customer conferences. For a few fun-filled, informative days, I get all pumped up with excitement. And then I get back to the office and work/life happens. High priority work comes in, staff changes, something happens and all the awesome stuff that I learned or wanted to do, just kind of fades to the background. I was resolved this year to not let that happen, at least on a personal level. To me, design was a big part of the conference last year, and it's something that I really identified with, especially Anya A'Hearn's session on Designing with Emotion. What I've observed with what we produce at work is that we have not consistently harnessed the power and beauty that is within the tool because we're still learning, even after using it on and off for a couple of years. I have seen workbooks that look all charty and are missing key elements given the audience we have...like leading/instructional language, or tweaking the defaults, and venturing out to other, more appropriate chart types, instead of bars and pies (not all pies are bad, but it takes awhile to change 20+ years of behavior). So, coming back from the conference all energized, I felt compelled to show people at work...look, this can be better. This led to a frustrating conversation with someone who can make Excel sing...and from there, I had a little story to write. On little side note. I originally started using blogspot, but I really wanted better separation of topics, so that data viz folks didn't have to read about me planning my daughter's birthday party, and as a result (and with Matt Francis's help), I moved my posts from blogspot to weebly. The unfortunate part is that the comments are lost. But, I have a site now that I'm really building how I like (and it's super easy, which is helpful for a non-techie like me). Then in October, I was inspired again by Tableau Design Month. This really fit in nicely with my goal of making design a priority in our work. And, one of my takeaways from the conference is actually something that I learned at the Facebook session, which is to not be afraid to fail. So, in spite of thinking that people might laugh at my idea, I emailed all of the folks in our agency with a desktop license and hyped up this design contest that I called Design Skills to Thrill. For me, this design contest wasn't about who could do some tricked out calculation (though that is super cool and totally over my head), but about the thought process and the story the participants wanted to tell. My goal was to demonstrate to the audience that things like layout and color matter, which we can apply when doing visualizations for work. I wanted to show what was possible and while I don't expect people to put zombie stick figures into their work visualizations, my hope is that it made folks think about thinking about something more they could do to improve the visual. It seemed like a good story to me, so I wrote it. While most of my posts have been well received, sometimes I hear crickets. 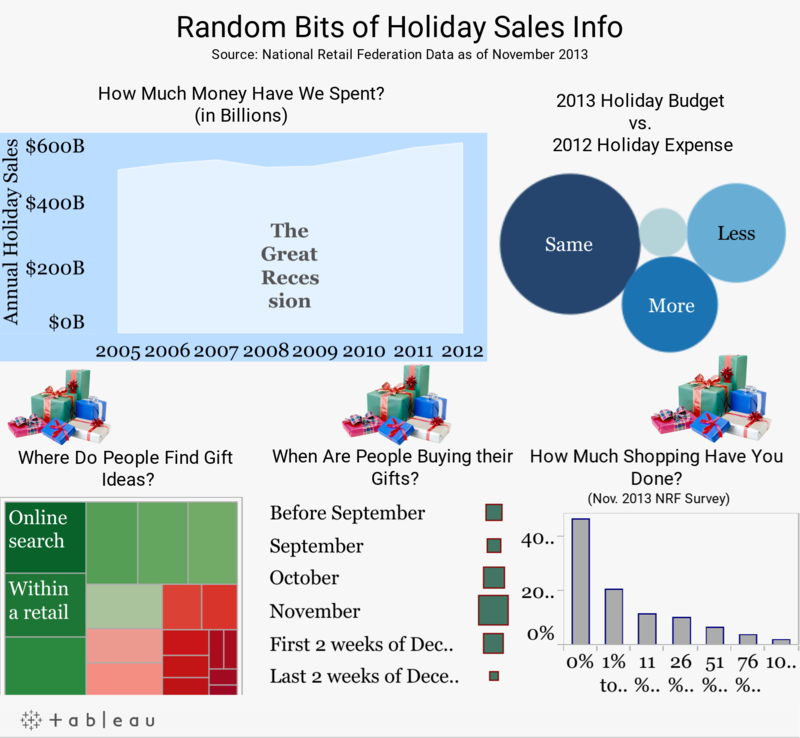 When I posted my Random Bits of Holiday Shopping Info (not really the best title, I'll admit), I didn't get a lot of comments (if any) on it. And that's okay. I think of it like baseball, no one ever hits 1.000, heck, without PEDs, .300 is pretty good. When I look at life (and in this case, blogging) that way, it makes me feel a whole lot better. Not every little story I write is going to win a major award, get retweeted by Zen Masters, or get favorited. And that's okay. That's not really why I write them. For me, it's online journaling; just getting my thoughts out. There are a couple of things to know about me. 1) Most of the time, I write like I talk and 2) I'm easily distracted. So here's a little story as an aside and then I'll return to the topic at hand. Based on what I learned from Andy and the folks at Facebook, when I returned from TCC13, I suggested to our Tableau guy at work that he and other "Tableau guys" should have office hours since there's a demand and it might help him manage his calendar. I thought he might have given me a pleasant brush off but just the other day, the "Tableau Guy" indicated that he was going to set up a lunch time session like Tableau Doctor. Sweet, I influenced that!! So I applied something I learned from a comment Jonathan Drummey wrote, which was that no one is a master of everything. This led to me to suggest that we should have a few folks attend these sessions who can provide guidance on things like design, performance, and calculations. It's something that's in the process of being set up, but there might just be a little story there. And if you've noticed, there's a theme, whenever I feel like I have a little story, I write. I foresee more stories about my journey on resolving my identity crisis and other fun stuff, and hopefully my little stories will resonate with at least one person. Outside of having this little creative outlet for me, having these stories influence someone else would be just about the best thing ever.